From the world’s largest manufacturer of sports yachts, the Maxum 3500 SY is a typical high-end American sports cruiser designed to meet the needs of family pleasure boating. Steve Raea looks further. The US Brunswick Corporation needs little introduction. It is the largest builder of pleasure boats in the world with annual net sales in excess of $US2 billion. With no fewer than 20 brands of boats designed for every type of boating experience, it is little wonder that the company knows what buyers want in a general sportscruiser. Indeed, it is within the realms of sportscruisers that the Brunswick Corporation has the biggest-selling badges. 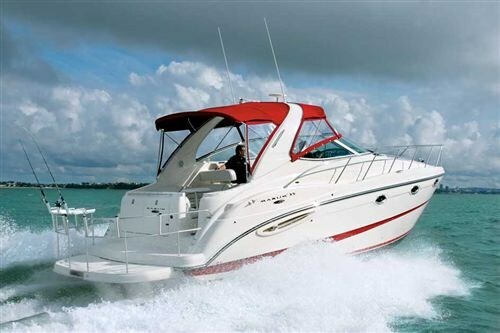 Among them is Maxum, which the corporation positions as a cut above its popular Bayliner brand. Priced at a premium, and with superior finishes, the Maxum is not the floating caravan one might expect but a genuine American sportscruiser raring to go. Maxum was established in 1987 and now produce a large range of sports-orientated trailerboats, mid-size cruisers and sports yachts up to the flagship Maxum 4200 SY. The Maxum 3500 SY actually measures 38" overall and carries a disproportionate 12"2' beam. Maximum beam is carried well forward in a design process the company calls Beam Forward Design. This is used to good effect to give the boat the internal volume of many 40-footers. It also provides plenty of support when cornering at speed with no inclination to dig in and drive off in tight turns. The downside might be experienced when punching into a rough sea given that there is more boat to push through. This will undoubtedly mean lots of spray and the chance of porpoising. It also results in a somewhat fuller figure that traditionalists might find difficult to appreciate from some angles. But with a moderate deadrise to aid stability and pronounced chines tapering to wide aft sections to increase lift, the 3500 feels sure-footed in the short wind-blown chop common to Auckland's inner Hauraki Gulf. The inclusion of Maxum's flat "Delta Plank" on the keel further facilitates level cruising. On the construction front, the hull derives stiffness from a full-length fibreglass-encapsulated grid that is hand-laminated to the hull. An internal fibreglass liner and key components are then bonded to the grid in a process Maxum calls Rigid Matrix Construction. These parts, the company says, become virtually a single unit providing a solid feel, comfortable ride and ultimate strength. The company also says it makes a fully functional prototype of each new design and submits it to rigorous performance testing that includes a "punishing regimen of endurance testing at the hands of professional drivers and technicians". One wonders if such testing would not be more challenging if performed by amateurs. Still, the transferable five-year hull and deck warranty is about as good as it gets for production-built boats. And there is no question that the Maxum looks the part with crisp large-radius mouldings and close-fitting internal liners. The hull is also protected with a vinylester resin laid down over the gelcoat to ward off any future risk of osmosis. Perhaps a little unusual for the American sportscruiser market is the option of diesel engines instead of the familiar petrol-powered sterndrive MerCruisers that tend to dominate the US region. While standard power is from twin 350hp MAG MPIs, the 3500 SY test vessel was fitted with twin 250hp Cummins diesels on conventional shafts. These should provide fewer maintenance issues and a longer service life than similar-sized petrol options. Fuel economy and range is also better, which should appeal to the New Zealand market. And while the smaller diesels lack the grunt of the bigger V8 petrol engines - particularly getting onto the plane - performance is surprisingly good with a fast cruise of 24mph and a spirited 31mph at Wide Open Throttle. The engineering systems and engine installation is all that you would expect from a manufacturer of this calibre. Access to the engine room is via a remotely-operated hydraulic hatch in the cockpit that provides good light and ventilation when working below. Fitted with an automatic oil change system, routine maintenance should not be an issue. The test vessel carried the full list of options which extends to reverse-cycle air conditioning and a 7KW diesel genset. These were also well fitted and engineered and reasonably accessible though engine-room lighting could be improved. Standard items include 230V power, engine-heated hot water, a fire-suppression system, transom shower, and a full set of covers including flyscreens. Again, the test vessel was fitted with a canvas upgrade including a bimini cover enclosing the helmstation and forward cockpit lounge. The immediate impression one gets upon boarding the Maxum is a sense of space. It would be easy to forget that this is a 35-footer (38' overall). This results largely from the seven-foot plus headroom under the oversized targa arch. The large wrap around windscreen, with cabin-top walk-thru, and button down overhead canopy tend to give the impression of a large garden centre conservatory rather than a cockpit. The only negative here is windage, but with twin screws, docking should not be an issue. Maxum literature describes the helmstation as oversized. And that it is. Americans' love big horsepower and the gauges that go with it. The 3500 SY has a menagerie of Faria instruments set into an enormous moulded gun-metal fascia that takes up two thirds of the cockpit and is adorned by a double bench seat. The walkthrough dash and opening windscreen makes easy work of getting to the double sun pads on the foredeck. A non-skid catwalk divides the sunpads. The bowrail and moulded toerails will help the crew on deck when on the foredeck, although the remote windlass makes light work of anchoring. A U-shaped settee opposite the helmstation provides underway protection for up to four passengers. The aft lounge is conventional with a U-shaped settee to port that converts to a large daybed if required. A central aft table is easily removed to provide easy flow through the rear of the boat when entertaining. Cockpit options on the demo boat included a double forward deck sunpad, an icemaker in the cockpit, stereo and spotlight remotes and an upgraded JBL sound system. Maxum also offers three colour options: blue, red and yellow. While very much a production boat, the Maxum 3500 boasts excellent finishes, firm-fitting upholstery and fair fibreglass mouldings. A point of difference over similar imports is the grossly extended two-tier dive platform. It is here the boat gets its extra length. Moulded from fibreglass, the rear platform looks like an add-on but reflects the manufacturer's desire to cater to those who are predominantly interested in water sports. There is no question, though, that it adds another dimension in terms of the boat's functionality. The test boat was further enhanced by the addition of a custom-built solid stainless aft rail incorporating rod holders and bait board. This was fitted in Hamilton by importer Fish City in recognition of Kiwis love affair with fishing. The aft transom lockers are lined and provide stowage for fenders and mooring lines, boathook, watertoys and fishing gear. The battery isolators and windless breaker are here too. The targa arch is fitted with lights for night sailing. Maxum has done well below deck, avoiding the trap of trying to accommodate a small army rather than mum and dad and a couple of kids. Unlike some caravan-type interiors, the 3500 features an open-plan layout that recognises sportscruiser-types are generally day boaters. The interior is not custom-built but the use of mushroom-coloured vinyls, patterned upholstery, grey carpet and mock cherrywood timber joinery gives the boat a classy and comfortable feel. The three-step companionway is moulded into the aft bulkhead and, while a bit steep, it does not protrude into the saloon. 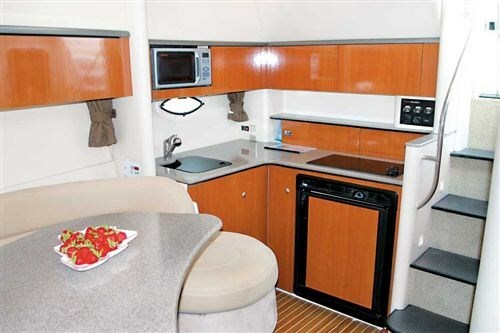 The small but functional galley is immediately to starboard and is equipped with a deep single stainless sink, microwave, two-burner hob and underbench Norcold fridge with ice tray. Cabinetry includes drawers and overhead lockers and reasonable counter space. The main saloon feature is the lounge that curves forward along the port side to the foot of the island-style double in the bow and wraps back around the dinette table. The lounge will seat six comfortably. 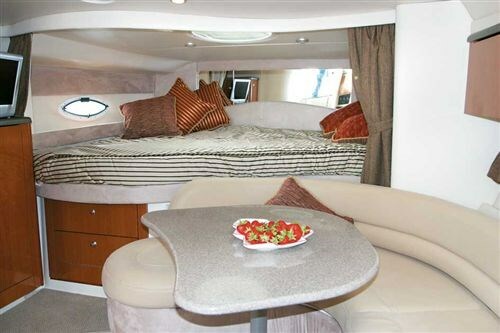 The forward double is set slightly athwartships, allowing room on the starboard side for a hanging locker, cabinets and flat-screen TV. Twin overhead hatches provide good downstairs lighting. Privacy is courtesy of curtains. There are no internal bulkheads forward of the companionway. A real plus is the large moulded head and shower opposite the galley. This is big enough to be of real use and has an overhead hatch and extractor fan to make it comfortable as well. The mid-cabin, like all mid-cabins, is set under the helmstation where headroom is an impossibility. But that said, Maxum has provided a settee where many other design expect you to go down on bended knees when trying to organise yourself for bed. The mid-cabin has twin bunks that convert to a double with an in-fill. There are twin hanging lockers, drawers and even a flat-screen television. It would be one of the better arrangements I have seen on a boat of this size. The boat's 1060-litre diesel capacity should give it a range of about 338 miles at cruising revs which is handy enough although the 151-litre water tank capacity is a bit miserly for a family planning on a weekend afloat. Ease yourself into the electronically-adjusted double helmseat and you soon work out that this is the place to be. Ahead of the adjustable sports wheel - linked to power-assisted rack-and-pinion steering - the low-profile windscreen provides an uninterrupted view around the horizon. The low-glare dash with digital depth readout, windlass remote, spotlight toggle and custom-fitted Raymarine C80 GPS plotter provide plenty of incentive to head for distant harbours. 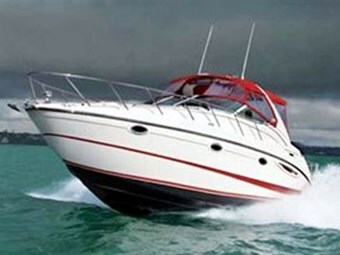 The boat's trim tabs are conveniently located near the throttles and linked to trim gauges. While initially a little reluctant to pull herself out of the hole, the twin Cummins diesels responded well to the correct trim and the boat settled down nicely and felt firm and rattle-free in a short, wind-blown chop. It was particularly useful when asked to corner at speed, Maxum's Beam Forward Design giving her plenty of grip in the water. The steering was positive yet firm. It was pleasing, too, to see that the extended boarding platform did not pick up water or direct spray back into the cockpit. All up, the Maxum 3500 SY lives up to its billing as a family-orientated sportscruiser. It is a mid-size boat with a big-boat feel. 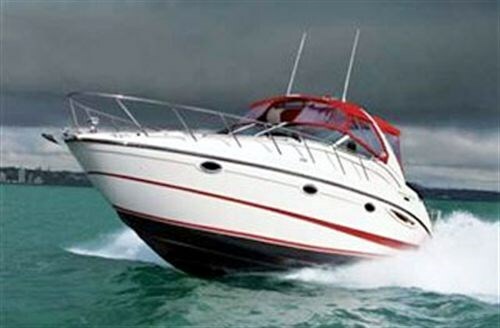 While perhaps a little initially under powered, the fuel economy and reliability of twin diesels on shafts should see it compete favourably with some of the imported Australian production boats in the sportcruiser genre.